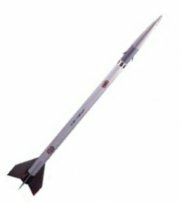 AeroTech Astrobee D [ARO-89015] - $94.99 : Sirius Rocketry Online Store, For the Serious Rocketeer! At Sirius Rocketry, we LOVE scale, and the Aerotech Astrobee D is the perfect way to fly mid power in super scale style! The Aerotech Astrobee D is a painstakingly crafted scale model. It is nearly 6 feet of breathtaking scale detail at almost half the size of the real thing. All of AeroTech's trademark construction features like durable precision molded fins, Fin-Lok fin mounting system, and waddingless ejection system combine with F and G motor power and dual nylon chute recovery to make this kit a "must have" scale rocket experience! Now includes screw-on aluminum 29mm motor retainer! Maxi Cure CA 2 Oz. Insta-Cure + CA 2 Oz.